Every night I sit in our bed before bedtime with our girls. I usually read them bedtime stories or even help them play educational apps with them on my iPad. One or both of them will somehow always ask me about the portraits we have hung on our wall to decorate our bedroom. It never fails, by the way! See, we have three photos framed and hung up. The one in the center is largest of the three and was of us kissing in the church immediately after we got married at the end of our mass. The other two next to it, on each side, were two different shots of us from our engagement portraits. The girls truly are enthralled and never seem to get enough hearing about our love story and the day mommy and daddy got married when looking at these photos. Often enough they both want to know where they were that day and still have to try to explain that they weren’t born quite yet! However, their enthusiasm is really something to behold. Anyway, I was recently contacted by Cozy Wall Art, which is a company that reates original vinyl wall art, which because of the matte finish will appear to be painted onto your wall, but are to install, as well remove, too. All of their original pieces of art are original designs from our owners/designers. Cozy Wall Art was begun to create products that would accent the life and personality of your home. Their products are accessible artwork – affordable prices with unique and diverse designs so that you are sure to find something that your family will enjoy for years. They offer elegant or lively designs for every room of your home, including family rooms, dining rooms and even kitchens, too. The More You Read Quote..
All these above are only a select few, I picked to share, they have many more, plus all you see can be customized to different sizes or colors if you ask. I ended up choosing this one above. I ended up choosing one that could actually accent my bedroom wall that I shared earlier that truly explains our love story quite perfectly, which can be found here. What do you think of our newest Cozy Wall art? When I first hung it up, my girls were there the whole time and kept asking me what it said. They now can repeat the phrase over and over. I have to admit I think it does sum up our love just perfectly in the dark red color to compliment our grey walls and the photo frames by adding that perfect subtle touch to our photo collage wall and making our decorating that much easier for sure! To get your own Cozy Wall Art, you can find them here or on Facebook, Twitter, Google+, and Pinterest, too. From Photo Mess to Photo Bliss. Introducing ThisLife, by Shutterfly. Why do your photos and videos—the most precious things you own—spend all their time out of sight and out of reach? Hidden in shoe boxes. Trapped in old phones. Buried in expired laptops. Concealed within folders. Within folders, within folders, within—you get the idea. With ThisLife, we can help you intelligently organize all your photos and videos so you can spend less time managing memories and more time making them. That means gathering your photos from your different devices and different sites – your smartphone and tablet, your laptop, from Facebook and Instagram, Flicker and Picasa. And not only from your device or your account, but from your spouse and family’s, as well! Finally, a way to consolidate photos from all your family members across all devices without having to worry about duplicates. Sign up for a free account today using your Shutterfly login. If you decide that this is the solution for you and your family, you can take advantage of our launch promotion – $59/ year (normally priced at $79) for our 25,000 photo and video plan plus a free 20-page 8×8 photo book ($29.99 value) or $139/ year (normally priced at $199) for our 100,000 photo and video plan plus a free 20-page 12×12 photo book ($59.99 value). Wow! That came out great Janine!! I would be so afraid that I wouldn’t line it up right and it would be permanently crooked, but you did a great job and it goes so well with your whole theme!! I love wall decals. I have three in my house and I think they are an easy and affordable way to decorate. So pretty Janine! You have such a great eye for home decor. It turned out perfectly, now I need to get one for the house myself! I like the wall art. The pictures you have up of you and your husband are all amazing choices!! I love the quote you chose! I’ve been wanting to put a quote over our WeMontage of our vacation pictures…it might be fun to do that over our huge ski one too! I’ll have to check this out! OH – I love how excited the girls are about your pictures and your new wall art (love the phrase you chose) — so fun to share the excitement and love with them!!! I love the way it fits with your beautiful pictures!! Perfection. Congratulations on the nomination. No one works harder at blogging than you, and it’s nice to see you get recognition. Have a great Hump Day, Janine. it looks great on the wall and how cute that the girls know what it says now! Oh I love these! There was one in a church we attended back in NJ and I thought it was so nice! I think it really adds something special to your portraits, Janine. Great company! BEAUTIFUL! I really love this art. You have inspired me to try it. Thanks so very much for sharing! These are gorgeous and I love the quote you chose! I use wall art and I love it. Thanks for sharing about Cozy Wall Art. I will be checking them out next time I am looking for something new. Ooh, I like that! It’s amazing how much pretty words can really make a difference on a wall. Nicely done! Great choice on the wall art. Fits perfectly with the photos! How cute that they are always asking you about the photos and now repeat the phrase below them!!! So cute that they don’t quite understand why they weren’t present when you got married :). And the thing at the bottom of the post regarding the new service from Shutterfly. That sounds pretty cool. Like a backup for all of your photos plus a free photo book! I love it! simply perfect!! We’re still trying to find the perfect art for our living room, bedroom, and the staircase, so there’s definitely tons of inspiration. Thanks for sharing, Janine! I like what you chose and it fits perfectly on your photo wall. And it’s so nice that the girls are so interested in your love and marriage. It gives them a secure and stable foundation, which you are providing anyway! Lots of love…….. I think it’s totally perfect for your home! I love the quote and I love the photos, and I love the placement of both! Aw, it looks beautiful!! I should do something like this in our room. I think we have just one little framed photo of us together as a couple. LOVE these. I have a few in my home too!! I am currently looking for some wall art since my walls have plenty of pictures but I feel like it’s missing some words. I don’t know what I want to say yet though. When I’m ready, I’ll be back! Looks great!!! 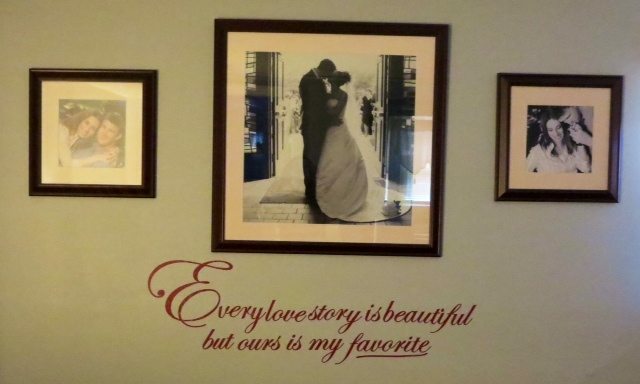 We have a wall with several sayings a reminder of our family and love. Janine that is so lovely! The pictures and new lettering are just beautiful! Always enjoy my visit here…thanks for sharing with the Thursday Blog Hop! Well it does compliment that beautiful wall collage of yours.